It was a wonderful time hanging out with Chef William Crandle of Stripsteak, Miami. When I am traveling I am always looking to try some of the top area restaurants. Last weekend in Miami I had the chance to try two top restaurants, both with completely different food and ambiance. One of the top restaurants in Seattle, RN74 by celebrity chef, Michael Mina, has been a Seattle fixture for more than a decade. Michael Mina now has over 20 restaurants from Hawaii to Miami, with even a restaurant in Dubai. A recent visit to Pizza & Burger and Stripsteak in Miami was a delightful culinary and visual experience that I won’t forget. Pizza & Burger is located in the Fontainebleau hotel, a Vegas style and posh and modern establishment on South Beach in Miami. Walking down the stairs into Pizza & Beer you are greeted with a chic, pub style atmosphere, with many beers on tap and a small but well-placed and priced wine list. My heart yearned for one of my personal favorites, the 2015 Dariosh Chardonnay ($120.00), but I decided to have the bartender make me a mezcal old-fashioned. I was not disappointed as the drink was beautifully balanced, showing a refreshing yet smoky side. I also enjoyed a few sips of their NV Tattinger Champagne ($16.00 per glass), which was very well-priced. The nachos were serious fabulous. For food we had a very challenging decision to make. It was one of those pub style menus where everything looks good. The manager helped us with some delicious selections that did not disappoint. 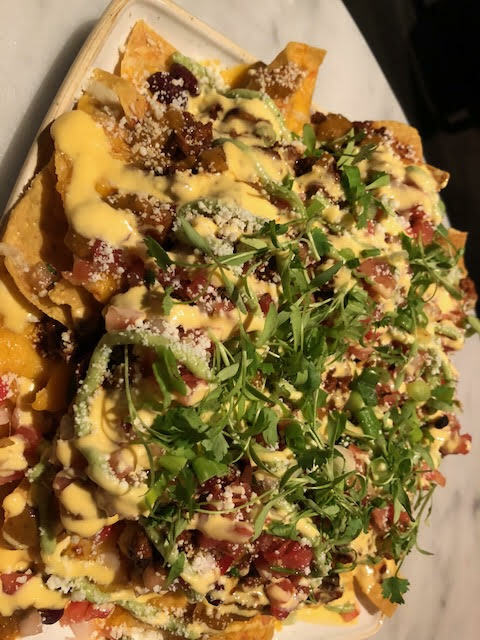 The nachos were made with a heaping pile of homemade chili and mounds of delicious cheese, cheese sauce, pico de Gallo and guacamole. My girlfriend and I agreed that this was some of the best nachos we have ever tried. We also ordered one of their signature dishes, the signature chicken wings with slow cooked honey sauce. The chicken was perfectly cooked, soft and tender. We wanted seconds. We needed to order a Pizza and Burger to share and we were glad we did. The scampi pizza came with locally sourced shrimp that were incredibly fresh and served as the perfect compliment to the garlic white sauce. The crust was also perfectly cooked. I chose the dry-aged steak burger, which melted in your mouth. With homemade cheese sauce, this seriously gave the RN74 burger a run for its money. Directly following our comfort food adventure we whisked off through a secret entrance leading us to Stripsteak, also located in the Fontainebleau hotel. We were transformed from pub to club as a lively, South Beach worthy experience awaited. Stripsteak has luxurious leather booths and even a live DJ spinning house music. We started our culinary experience in the kitchen, with Stripsteak chef, William Crandle, as we were greeted to a delightful array of amuse bouches. Champagne is always a great way to kick off a great meal — especially when you begin with the 2006 Veuve ‘La Grand Dame’ Champagne (WWB, 95), which was a downright stunning combination for the second best thing I ate all night. Yes, that is Iranian asetra caviar with a succulent oyster. This was a jaw-dropping pairing. We enjoyed a king crab amuse with hints of summer truffle that also paired marvelously with the tete du cuvee champagne. The homemade chocolates, particularly the passion fruit chocolate was absolutely delightful. This was only the beginning of our memorable meal. Service was impeccable throughout the night as staff operated at a perfect cadence. We could see kitchen staff mingling from our seat as they appear to truly love where they work. You can see that level of care and precision in everything you eat at Stripsteak. Upon being seated, we chose several courses including the PBJ style foie gras and the steak tartare with summer truffle shavings. The foie gras melted in your mouth. It was also the perfect amount of foie. 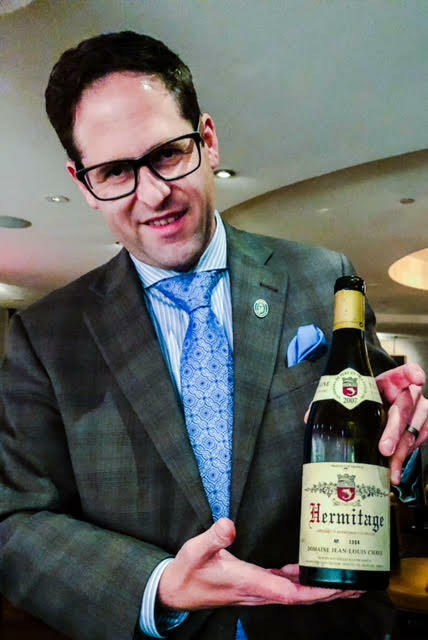 Advanced sommelier, Chris Zarcadoolas, guided us through a host of amazing wines on Coravin. The 2008 R. Lopez de Heredia ‘Vina Tondonia Gran Reserva’ Rose (WWB, 92) was an absolutely stunning selection to be paired with the steak tartare. The rich texture of the wine and beautiful acidity with good range really made the pairing shine. But the highlight pairing of this meal was truly the insanely good 2007 Jean-Louis Chave Hermitage (WWB, 95) with the lobster pot pie. The silky and buttery texture of this wine was just an incredible match to the succulent lobster and Thermidor sauce. My mouth waters as I write this. My fillet mignon was cooked to perfection and was matched with five different signature Michael Mina steak sauces. Kudos to chef Crandle in crafting these irresistible matches to his melt in your mouth steaks. 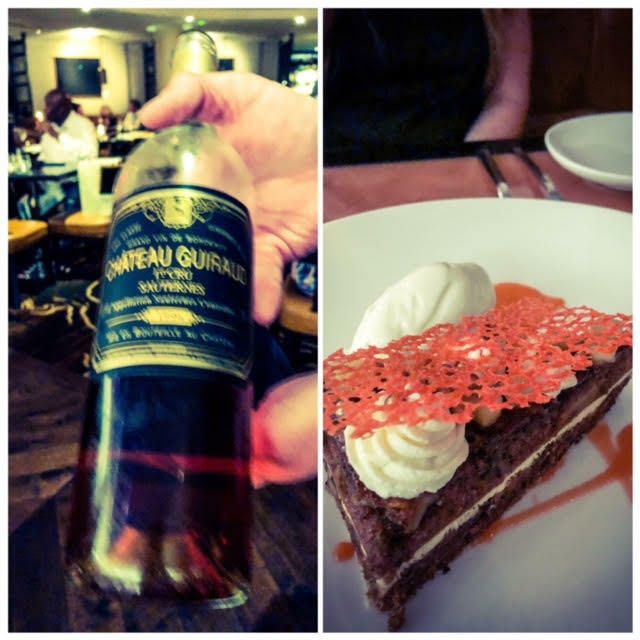 We finished the night with one of their signature desserts, carrot cake and the 1996 Chateau Guiraud Sauternes (WWB, 92) which has lost some sweetness but had an oily texture and had picked up some wonderful tertiary notes. This was the perfect end note to what was an absolutely delightful culinary adventure in Miami.